Dylan’s sensitivity to sound is one of his biggest barriers to communication and appears to be the biggest cause of his anxiety, especially with the outside world. For as long as I can remember Dylan has had an intense fear of hand dryers in public toilets. He seems to be okay with hoovers and hairdryers but hand dryers absolutely terrify him. Even before they come on the mere presence of them is enough to make him cling onto me and not want to go into the toilets. Dylan is affected by predictable sounds like the hand dryer but also unpredictable sounds like a revving motorbike or baby crying, in fact babies are a particular dislike of Dylan’s, he seems rattled by their unpredictable high pitched shrieking and noises – even when they’re happy. Dylan will cackle to himself loudly and appear to be laughing but the tell-tale signs of him grabbing at his ears tells us that this is an uncomfortable laugh rather than one of joy. To counterbalance the level of noise and unpredictability when outside Dylan has started wearing noise reducing headphones. These are not specialist items and are easily brought, we got Dylan’s from Amazon and they just dampen down any noise when worn. Dylan can still hear really well with them and can still be startled by unexpected noises but he definitely isn’t as unnerved by them as he is without the ear defenders. 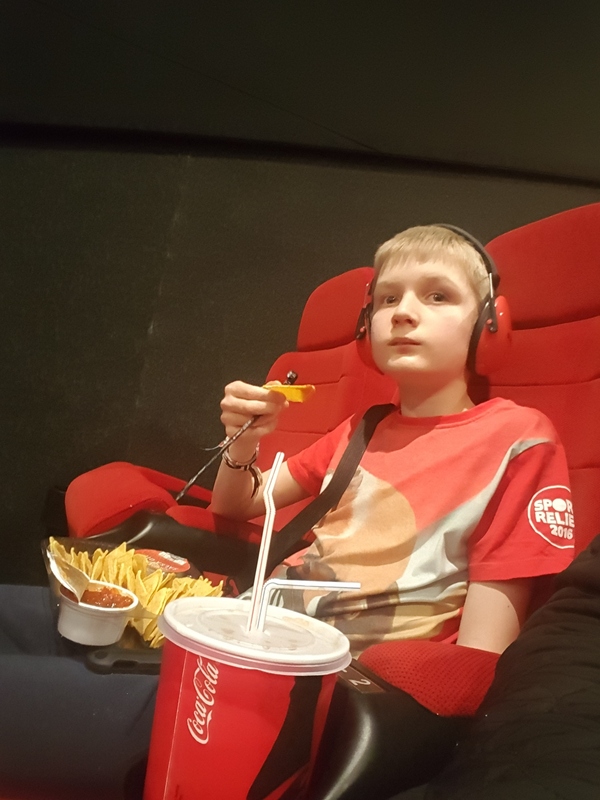 When out and about people certainly notice the big red ear defenders that Dylan wears when out and about – in fact he doesn’t really wear them at home. No one has directly asked why he wears them but people look; I understand it’s a very visual clue that Dylan’s needs are a bit different. Sometimes Dylan will wear them when out at more familiar restaurants and some of the service staff have kindly asked about sign language for Dylan as if he is deaf. We have to explain, Dylan can hear, almost too much, that’s why he is wearing them. You can speak to him and he can still hear you. The service staff mean well but you can tell from their puzzled looks that they don’t really get what we mean. Don’t for one moment think that Dylan has a general aversion to noise; as a non-verbal child he is certainly not quiet! From the minute he wakes to the second he goes to sleep his days (and nights) are filled with humming, clicking his tongue, cooing to himself, sometimes loud and sometimes very soft. It’s not an unpleasant din but it is continuous. For us as a family it’s almost like white noise and we often don’t even notice it but those unfamiliar to it can pick up on his ‘stimmy’ sounds. Stimming – or self-stimulatory behaviours- such as Dylan making his sounds are not necessarily to convey communication or a message but to regulate the feelings for Dylan within his own head. A lot of the humming like sounds he makes gives him a soothing vibrating feedback inside of his head which tend to block out a lot of external stimuli. It seems that Dylan is doing just that, but ALL of the time. He finds the outside noise and unpredictability too much and so makes constant noise to try to regulate that for himself and remain focused on the rest of the stuff he needs to do. I still find the sound of babies really difficult to cope with, and I also find ear defenders really really helpful. I used to click my tongue a lot when I was a child!